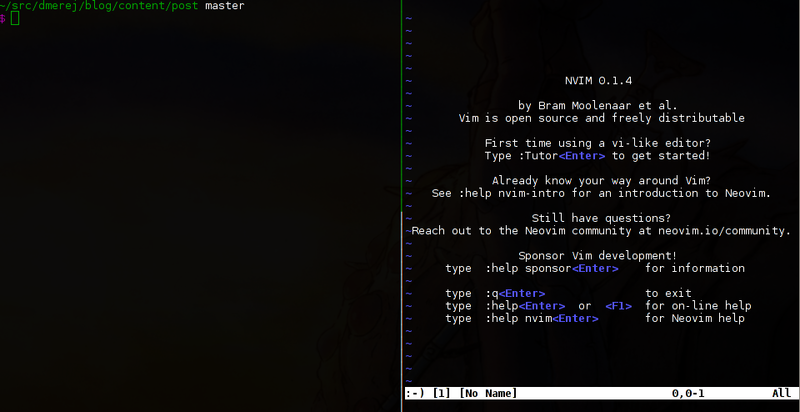 This is a follow-up of my previous post on Vim and cwd, so I suggest you go read it first. Here are a few more tricks I use on top of the other vim settings I’ve previously described. This is useful when you have two terminals open. Let’s assume you want to edit ~/src/dmerej/blog/content/post/hello.md. You don’t want to type ~/src/dmerej/blog/content/post/ again. A solution is to use vim --remote hello.md from the terminal on the left. Neovim folks removed the --remote and --servername options. The idea is that you should use the new RPC interface instead. You can use a nvr or your own solution. Otherwise I use the neovim Python client API to attach to a running Neovim instance and open the file there. I use the Ctrl-P plugin. It has a “Most Recent Used” mode that I find very convenient. So I use this trick to change the working directory of the calling terminal. To do so I use z. This tool installs a zsh hook and store every working directory in a “database”. Then you can just type a small part of the directory you want to go to, and it will use a “frecency” algorithm to get you there. There’s the filename, followed by a colon (:), followed by a line number. Of course, you want to open the file in vim to fix it. You can try to carefully select only the filename without the :42 part, or after having copy/pasted the full word, removing the extra characters using backspace. And then you remember 42 and type 42G (or :42) to go to the correct line. That’s all folks :) Hope you liked it.